Our ancestors evolved on the savannahs of tropical Africa, arid grasslands home to herds of large herbivores. Later, some ancestors migrated out of Africa, into non-tropical Eurasia, a cooler climate for which evolution and experience had not carefully prepared them. They discovered northern grasslands, called steppes, home to herds of gazelles, argali sheep, saiga antelope, reindeer, and wild horses. These shortgrass prairies extended 5,000 miles (8,000 km) from Hungary to Manchuria. The struggle to survive on the steppes encouraged innovation (warm clothing, tighter shelters, food storage, etc.). Groups that developed better stuff were less likely to become buzzard food. The first species of the horse genus (Equus) emerged in North America about 4.5 million years ago. Some migrated to South America, and others crossed the land bridge to Eurasia, and spread as far as Western Europe. Maybe 15,000 years ago, hunters from Siberia discovered America. Over the following centuries, a surge of megafauna extinctions occurred. The last horse in the Americas died in Patagonia about 7000 B.C. In 1493, Spaniards brought domesticated horses back to America, and by 1550, there were 10,000 roaming the golden plains. In Pleistocene Europe, humans loved to hunt horses. At the Roche de Solutré site, near Mâcon, France, archaeologists have found the bones of up to 100,000 horses, with dates ranging from 37,000 to 10,000 years ago. During seasonal migrations, horses were trapped, butchered, and smoked. By the sixth millennium B.C., the once plentiful wild horses of Western and Central Europe’s river valleys were apparently eliminated by overhunting. To the east, large numbers of wild horses managed to survive on the vast open steppes, where they were less vulnerable to traps. Hunters on foot were much slower than speedy critters so, prior to horse domestication, few humans could survive in the steppe ecosystem. Cattle, goats, and sheep were domesticated in the Middle East, but horses were domesticated much later (4000 B.C. ), on the Pontic-Caspian steppe, which spans from the Ukraine to western Kazakhstan, along the north coasts of the Black Sea and Caspian Sea. Wild horses were big, strong, fast, intelligent, and aggressive. When spooked, they attack, and swift kicks can be fatal. They were not easy to domesticate. Zebras, their Equus cousins, have never been tamed — the older they get, the meaner. Prior to the enslavement of horses, society was powered by human muscles. The addition of horse power was a tremendous boost. They could move much larger loads. On horseback, humans could move rapidly, and travel long distances. 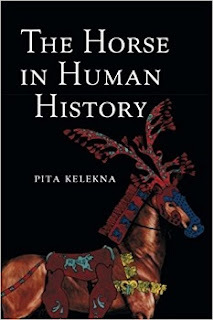 The Horse in Human History, by anthropologist Pita Kelekna, is a mind-altering book. It describes our turbulent 6,000 year relationship with domesticated horses. Few readers were raised in tribes of nomadic pastoralists. Our civilized world teaches us grand stories of magnificent empires, and their ongoing conflicts with scruffy bloodthirsty barbarians. Kelekna reveals the missing half of the story that our culture has bleeped out — the tremendous impact these nomadic horsemen have had in shaping the world of today. As they grew in scale, both the sedentary farmers and nomadic horsemen caused injuries to the ecosystem. The earlier hunter-gatherers of the steppe caused far less disturbance. At first, domesticated horses were kept for meat, milk, and hides. Compared to other livestock, horses were more tolerant of snowy conditions, better able to survive on low quality forage, and required less pampering. Because horses were highly mobile, and could go up to four days without water, herders could utilize grasslands farther from rivers, and maintain larger herds. Nomadic life was an ongoing quest to move hungry herds to greener pastures, so agriculture was rarely an option. They learned to survive largely on milk, milk products, and wild foods. Eventually, folks figured out how to utilize horse power for hauling packs, and for pulling carts, wagons, chariots, and plows. By and by, they transported trade goods, technologies, religions, ideas, and infectious diseases over long distances. Bridle, saddle, and stirrup innovations eventually enabled humans to ride horses, at high speed, while effectively using deadly weapons. One herder on foot could oversee 150 to 200 sheep, but a mounted herder could manage 500. Horse domestication promoted the expansion of farming and herding, spurring population growth and conflict. Mounted prospectors were better able to explore remote regions, and horse power was a tremendous asset for labor intensive mining operations. This set the stage for the emergence of the Iron Age on the Anatolian steppe (Turkey). Iron was history-altering big juju. Old fashioned warriors on foot became sitting ducks for speeding war chariots. Later came mounted cavalry, which was even more deadly. Then, armored knights on armored horses. Then, infantry soldiers got halberds, pikes, and crossbows, which reduced knights to wolf chow. Then, cannons. And so on. In an endless arms race, every brilliant innovation was inevitably trumped by something even more deadly. Societies that did not maintain cutting edge capabilities were doomed to be dismembered by the cutting edge. Readers learn about the Mongol blitzkrieg that rapidly created the largest contiguous land empire in history, spanning the steppes from the Baltic to the Pacific. It survived for a few centuries until the Ottomans stomped them. The spread of Islam spilled oceans of blood, as did the Christian Crusades. Kelekna’s tireless recital of bloodbath after bloodbath, the rise and fall of countless cocky gangbangers, is stunning, and before long, absurd. The words you are reading right now are English, another inheritance from the steppe nomads. English is one of many Indo-European languages that branched off from the nomads’ ancient mother tongue, proto Indo-European (PIE). Around 3000 B.C., PIE split into two language families, as people zoomed off in many directions in their new horse drawn carts. The satem group includes Baltic, Slavic, Albanian, Armenian, Iranian, Punjabi, Hindi, Urdu, Bengali, and Nepali. The centum group includes Celtic, Italic, Germanic, Greek, Anatolian, and Tocharian. Today, the first language of more than a third of humankind is one of the Indo-European offshoots. Multinational religions absorbed spiritual beliefs of the steppe nomads. Zoroastrianism originated among Iranian tribes. Their beliefs included one supreme god, a seven day creation, angels and demons, a coming savior, virgin birth, heaven and hell, and judgment day — which influenced Judaism, Buddhism, Christianity, and Islam. These four religions emerged between 2000 B.C. and A.D. 1000, the era of equestrian empires. Today, their believers include 72 percent of humankind. Pack trains of llamas could travel up to 12 miles per day (19 km), with each animal carrying up to 101 pounds (46 kg). Horses, donkeys, and mules were far better pack animals. Speedy long-distance communication was provided by messages relayed from one Inca runner to the next. This was much slower than Genghis Khan’s pony express system, which could move messages 248 miles (400 km) per day. Up north in Mesoamerica, they had wheels, but they were only used on tiny clay toys. Northern pack animals had two legs. On a good day, a healthy lad might carry 50 pounds (23 kg) for 13 to 17 miles (21 to 28 km). Without carts or pack animals, Mesoamericans could not create vast sprawling empires like Rome. While the Mayans built some roads, hiking in Mexico was via dirt paths, where they existed. Military activities were restricted. Each soldier had to carry his own provisions, which limited load size and distance travelled. Thus, if supplies could not be snagged from villagers along the way, adventures would have been limited to round trips of eight days or so. In Eurasia, huge Mongol cavalries could zoom across the steppe at 68 miles (110 km) per day. Ideas also moved slowly in a horseless world, if they moved at all. The brilliant mathematical achievement of the Mayans was the invention of the zero — 500 years before the Hindus. In the Old World, the extremely useful idea of zero spread fast and far, while the Mayan zero never left home. The voyage of Columbus depended on the existence of countless tools, resources, and skills, none of which were invented in Spain. Some came from as far away as China, like gunpowder, forged steel, paper, and printing. Imagine what today would look like if the concept of gunpowder had never left China. Bottom line, if horses had never been domesticated, the world of today would be unimaginably different, and far less trashed — maybe. In fact, big bloody civilizations did emerge in horse free America, develop productive agriculture, and feed growing mobs. In South America, they were making bronze tools, and ornaments of silver and gold. When Cortes first arrived, the Valley of Mexico had two million residents, and Tenochtitlan was a city of 200,000 — twice the size of Paris at that time. By 1705, on the buffalo rich plains of Texas, the Comanche acquired horses. “Like the Eurasian steppes, before the horse, the prairie had few human inhabitants. Tough sod discouraged farming, and hunting speedy large mammals on foot in open country was not easy.” Comanche horsemen could now ride faster than buffalo, and kill as many as they wanted. Many more people could be fed. Other tribes got into the game, and grew in size. Like any ecosystem, grasslands have limited carrying capacity — growth is the mother of conflict. 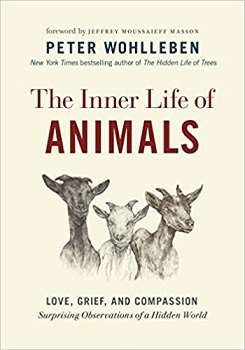 The domestication of plants and animals, especially the horse, radically altered the human saga. Hunter-gatherers were egalitarian, non-hierarchical. Personal belongings were minimal, and sharing was the key to survival. For pastoralists, domesticated horses were perceived to be personal property, and status symbols. A new, toxic, and highly contagious belief was born — you are what you own. Stealing horses became a get-rich-quick scheme. Raiding led to counter raids, blood was often spilled, and an era of intertribal warfare emerged, in both the Old World and New. Today, the insatiable and idiotic hunger for status is pounding the planet to pieces. I’ve only scratched the surface here. Kelekna did an outstanding job of giving us a long, powerful, and sobering look in the mirror. Thankfully, she does not visit the fairy pool of magical solutions, fill the obligatory slop bucket, and dump it over our heads. The traditional path of endless escalating growth and conflict isn’t taking us anywhere good. She suggests that contemplation, communication, and cooperation might provide an antidote for the urge to self-destruct. We haven’t tried that. Hey! 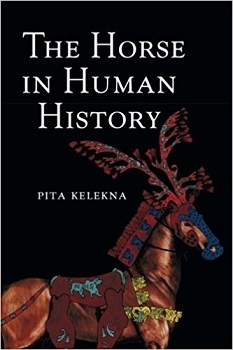 Kelekna, Pita, The Horse in Human History, Cambridge University Press, New York, 2009. Today, horse power has been replaced with machines powered by fossil energy, a nonrenewable resource that does not have a long and rosy future. Can seven-point-something billion humans return to horses? By 1900, modern cities had become horrid smelly nightmares. Read this: From Horse Power to Horsepower.